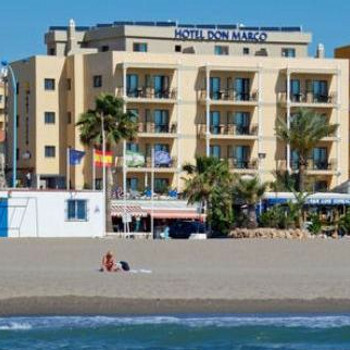 Booked two holidays in the January sale 2018 with LOVE HOLIDAYS at the SOL DON MARCO Hotel in Torremolinos, Costa Del Sol for April 17th 2018 for one week and October 2nd 2018 for two weeks. Love Holidays emailed me over one month later February 2018 to advise me the hotel had sold me the room too cheaply!!!! I've booked the time off..... I've bought my train tickets to the airport and......I've paid for my transfers!!! I was extremely disappointed with my stay at this hotel. I have stayed at many 4 star Sol Hotels and would say that this does not measure up at all. At Best I would rate this as 3 star. Firstly the positives the rooms were very clean and more than adequate however the rooms are on the small side. The En-suite is very good with a good separate shower and bath. My main negative about this hotel is the food. When we stayed you had to eat at the Don Pablo as the Don Marco restaurant was closed. This was not advised at booking stage the food was very unappealing and cold. Who wants brussel sprouts for their breakfast. The Staff were very unfriendly also. The Hotel Don Marco is a beautiful hotel built in 2004. We stayed over New Year and had a wonderful holiday everyone is very friendly the service is exceptional. Our bedroom was beautiful and so modern. There are nine swimming pools and you have the use of the Don Pablo and the Don Pedro facilities and you can eat in the other two hotels on the complex if you wish. We loved it so much we are going back in September. A New Year's Eve Gala Dinner was included in our stay and the meal (8 courses was out of this world) free wines and spirits until 1 am and we were all give party bags with lots of fun hats etc., and the traditional twelve grapes for the Spanish New Year. The Don Marco is the quietest of the three hotels and had a lovely atmosphere well worth the extra.